My BubbleBee was created for BubbleBee by me (David Slack) and designed by the multidisciplinary designer Tadporn Wudhinan. The site uses Drupal 7 for the main CMS and uses the PayPal api for the payment. I was thinking of using Ubercart for the payment system but I decided it was just too big so went straight to the api. The site also sports some Flash animations which, although look great, posed a problem for the rubbish no-flash iOS. To overcome the iPhone problem, I have made the site go to images if a phone is detected or if there is no flash player. All in all, the site looks great and feels great on whatever device is being used. 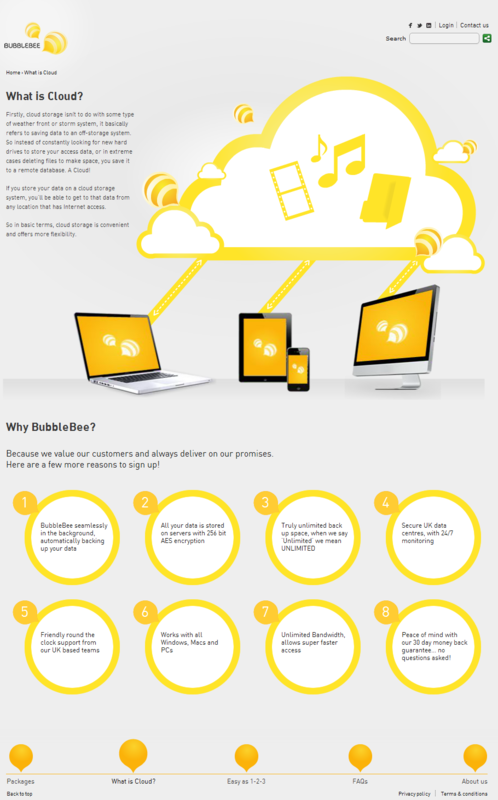 Bubble Bee offer a number of products for backing up your Mac or PC and also a place to keep all your files.